High ratio zoom lens housed in a compact construction and incorporating Sigma's original OS (Optical Stabilizer) function. High zoom ratio lens designed exclusively for digital SLR cameras and incorporating Sigma's original OS (Optical Stabilizer) function. SLD glass and Aspherical lenses provide high image quality throughout the entire zoom range. Super multi-layer coating reduces flare and ghosting. Compact construction of 88.5mm (3.5") in length and 74mm (2.9") in diameter. Minimum focusing distance of 35cm/13.8 inches and maximum magnification of 1:3.8, making it ideal for close-up photography. HSM ensures quiet and high-speed autofocus. Mounts: Sigma, Canon, Nikon, Pentax*1, *2, Sony*1 *1 OS function is not available. *2 If the camera body does not support HSM motor, AF will not work. This compact high zoom ratio lens is designed exclusively for digital SLR cameras and incorporates Sigma's original OS (Optical Stabilizer) function. This system uses two sensors inside the lens to detect vertical and horizontal movement of the camera and works by moving an optical image stabilizing lens group to effectively compensate for camera shake. It offers the use of shutter speeds approximately 4 stops slower. It is the ideal lens for several type of photography such as wide-angle, telephoto and close-up. SLD (Special Low Dispersion) glass, a molded glass aspherical lens and two hybrid aspherical lenses provide excellent correction for all types of aberrations. The super multi-layer coating reduces flare and ghosting. High image quality is assured throughout the entire zoom range. This lens has a minimum focusing distance of 35cm (13.8") at all focal lengths, and has maximum magnification of 1:3.8, making it ideal for close-up photography. This lens incorporates HSM (Hyper Sonic Motor), which ensures a quiet and high-speed autofocus. 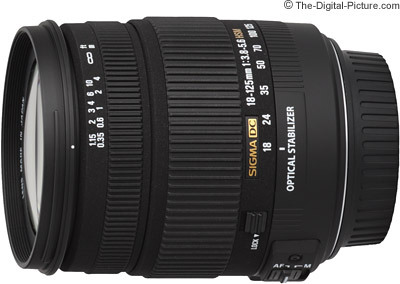 Back to the Sigma 18-125mm f/3.8-5.6 DC OS HSM Lens review.